Studies that reported hepatitis B virus (HBV) reactivation in rheumatoid arthritis (RA) patients have caused attention of disease-modifying antirheumatic drug (DMARD)-related HBV reactivation. Most of the studies were focused on HBV reactivation risk of biologic DMARDs; insufficient data are available to identify the exact risk of conventional DMARD (c-DMARD)-related HBV reactivation. This prospective study aimed to investigate the risk of HBV reactivation in HBV-infected RA patients who received c-DMARDs. 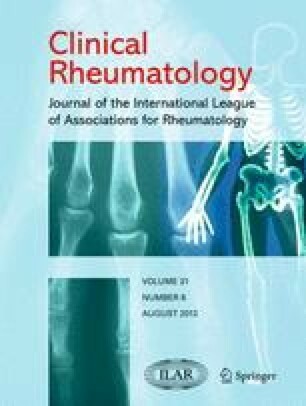 A total of 476 RA patients were screened in this prospective non-randomized, non-controlled study. HBV-infected patients characterized by hepatitis B surface antigen (HBsAg) positive or HBsAg negative/anti-hepatitis B core antigen (anti-HBc) positive were analyzed for HBV DNA, followed with HBV DNA monitoring scheduled every 3 months, serum alanine aminotransferase test at 2-month intervals, or more frequently. Prevalence of HBsAg positive and HBsAg negative/anti-HBc positive was 6.51 and 51.1 %, respectively, among the 476 RA patients. Among 211 patients (23 patients were HBsAg positive and 188 patients were HBsAg negative/anti-HBc positive) who received c-DMARDs without antiviral prophylactic treatment, 4 patients developed HBV reactivation. Both HBsAg positive and HBsAg negative/anti-HBc positive patients have the possibility of developing HBV reactivation. There was no correlation between HBV reactivation and any specific c-DMARD. Glucocorticoid coadministration and negative anti-hepatitis B surface antigen (anti-HBs) at baseline showed correlation with reactivation. In conclusion, it would be rational to initiate antiviral prophylaxis according to risk stratification rather than universal prophylaxis for HBV-infected RA patients. Conventional DMARDs are relatively safe to HBV-infected patients with low reactivation risk (low HBV DNA level, no GCs administration, and anti-HB positive). This study was supported by the grant no. 08010110089 from the Chinese Medical Association.